Price: Unknown, $35 for standard edition gin at Schneider’s of Capitol Hill. Thanks for Lee & Abby for the bottle. Appearance: Mostly clear but with an amber tinge. Nose: Grain alcohol, lime peel, caraway, pine sap. Palate: Full and soft with some harshness on the back end. Citrus, angelica, licorice, caraway. Finish: Big cough drop finish. Sap and alcohol linger for a very long time. Mixed: Did very well in cocktails with vermouth (martinis, Negroni, etc), but overpowered in tonic and a Tom Collins. Parting words: New Columbia was founded by two hobbyist couples (related I’m guessing) back in 2011. 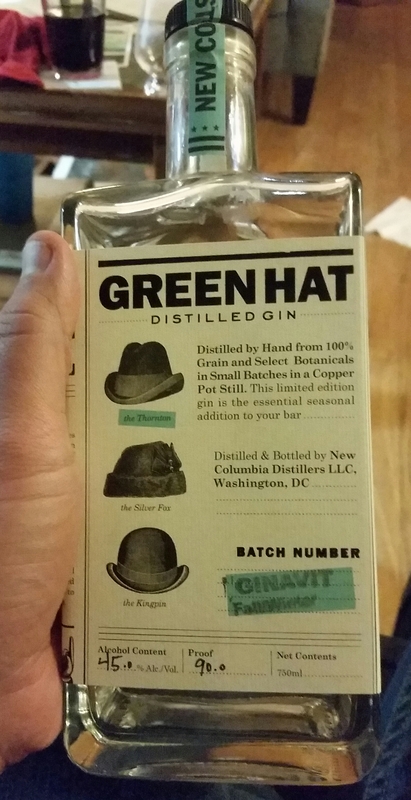 In spite of the corny prohibition-related marketing (The man with the green hat was apparently a DC bootlegger), this is an idiosyncratic but solid cocktail gin. It lacks the finesse of Miller’s, another caraway-forward gin, but if they’re going for something like Aquavit, as the name suggests, maybe the rougher character is in keeping with that tradition. At any rate, Green Hat Fall/Winter edition is recommended.